This tenth article, which is part of the series on Linux device drivers, talks about kernel space debugging in Linux. Put the debugger into the kernel itself. And then the debugger runs from within, accessible through the usual monitor or console. An example of it is kdb. Until kernel 2.6.35, it was not official, meaning its source code was needed to be downloaded as 2 set of patches (one architecture dependent and one architecture independent) from ftp://oss.sgi.com/projects/kdb/download/ and then to be patched with the kernel source – though since kernel 2.6.35, majority of it is part of the kernel source’s official release. In either case, the kdb support needs to be enabled in the kernel source and then the kernel is to be compiled, installed and booted with. The boot screen itself would give the kdb debugging interface. Put a minimal debugging server into the kernel; a debugger client would then connect to it from a remote host system’s user space over some interface, say serial or ethernet. An example for that is kgdb – the kernel’s gdb server, to be used with gdb (client) from a remote system over either serial or ethernet. Since kernel 2.6.26, its serial interface part has been merged with kernel source’s official release. Though, if interested in its network interface part, it would still need to be patched with one of the releases from http://sourceforge.net/projects/kgdb/. In either case, the next step would be to enable kgdb support in the kernel source and then the kernel is to be compiled, installed and booted with – though this time to be connected with a remote debugger client. Please note that in both the above cases, the complete kernel source for the kernel to be debugged is needed, unlike in case of building modules, where just headers are sufficient. Here is how to play around with kgdb over serial interface. Pre-requisite: Either kernel source package for the running kernel is installed on your system, or a corresponding kernel source release has been downloaded from http://kernel.org. Once configured and saved, the kernel can be built by typing make in the kernel source directory. And then a make install is expected to install it, along with adding an entry for the installed kernel in the grub configuration file. Depending on the distribution, the grub configuration file may be /boot/grub/menu.lst, /etc/grub.cfg, or something similar. Once installed, the kgdb related kernel boot parameters, need to be added to this newly added entry. 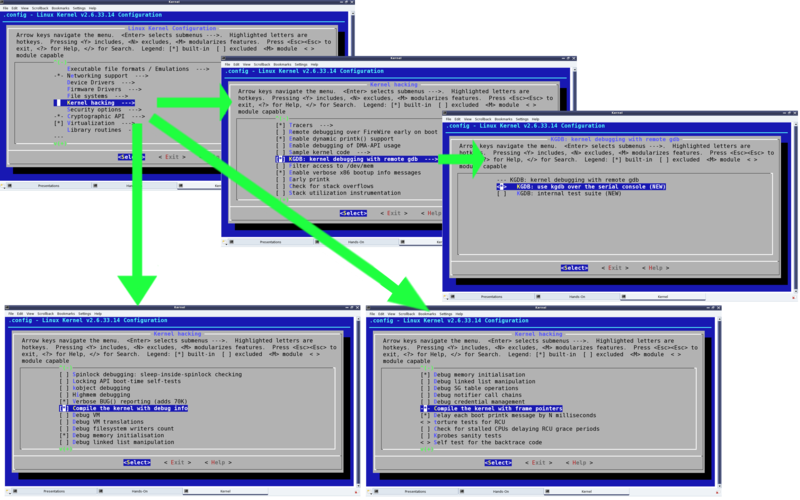 Figure 16 highlights the kernel boot parameters added to the newly installed kernel, in the grub‘s configuration file. kgdbwait enables the booting kernel to wait till a remote gdb (i.e. gdb on another system) connects to it, and this parameter should be passed only after kgdboc. With this, the system is ready to reboot into this newly built and installed kernel. On reboot, at the grub‘s menu, select to boot from this new kernel, and then it will wait for gdb to connect with it from an another system over the serial port. All the above snapshots have been with kernel source 2.6.33.14, downloaded from http://kernel.org. And the same should work for at the least any 2.6.3x release of kernel source. Also, the snapshots are captured for kgdb over serial device file /dev/ttyS0, i.e. the first serial port. Pre-requisite: Serial ports of the system to be debugged and the another system to run gdb from, should be connected using a null modem (i.e. a cross over serial) cable. Here are the gdb commands to get the gdb from the other system connect to the waiting kernel. All these commands have to be given on the gdb prompt, after typing gdb on the shell. 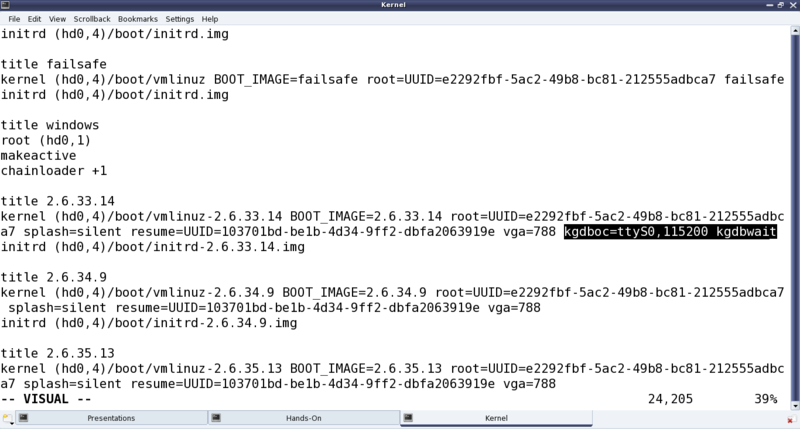 In the above commands, vmlinux is the kernel image built with kgdb enabled and needs to be copied into the directory on the system, from where gdb is being executed. Also, the serial device file and its baud rate has to be correctly given as per one’s system setup. After this, it is all like debugging an application from gdb. One may stop execution using Ctrl+C, add break points using b[reak], step execution using s[tep] or n[ext], … – the usual gdb way. For details on how to use gdb, there are enough tutorials available online. In fact, if not comfortable with text-based gdb, the debugging could be made GUI-based, using any of the standard GUI tools over gdb, for example, ddd, Eclipse, etc. By now, Shweta was all excited to try out the kernel space debugging experiment using kgdb. And as she needed two systems to try it out, she decided to go to the Linux device drivers lab. There, she set up the system to be debugged, with the kgdb enabled kernel, and connected it with an another system using a null modem cable. Then on the second system, she executed gdb to remotely connect with and step through the kernel on the first system. <remote_mac_addr> is optional and defaults to broadcast. This entry was posted in Linux Device Drivers and tagged Device Drivers, kdb, Kernel Space Debugging, kgdb, LFY, Linux, OSFY on November 1, 2013 by Anil Kumar Pugalia.